So in my infinite wisdom, I piped up and offered to host Thanksgiving at our house this year. The menu planning began, the research, the dread (I was challenged to recreate Steve’s mothers pecan pie) and the anticipation. I have to say, things went well, and we all had a great day. They serve this salad on their Raw Bar and it is delicious! 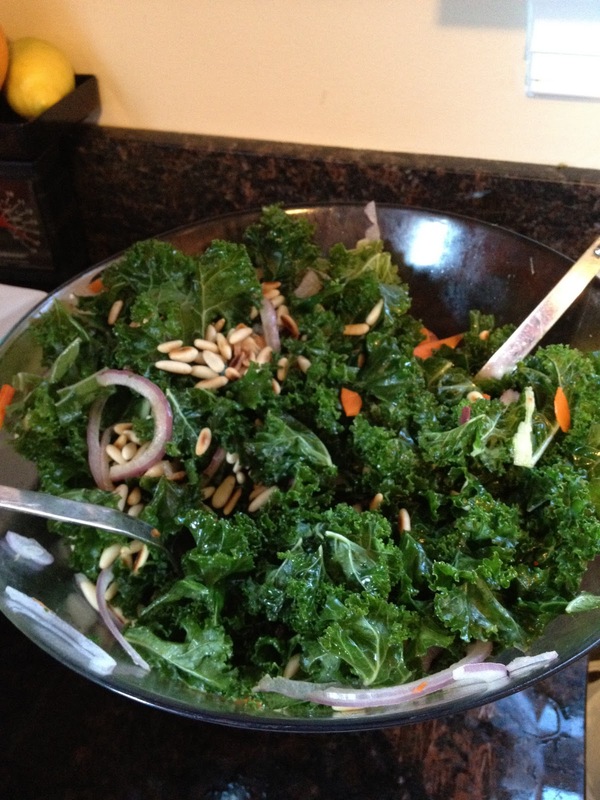 I did toast my pine nuts, but otherwise its a leafy kale salad with a Apple cider vinegar (Bragg’s), olive oil and lemon juice dressing, delicious! 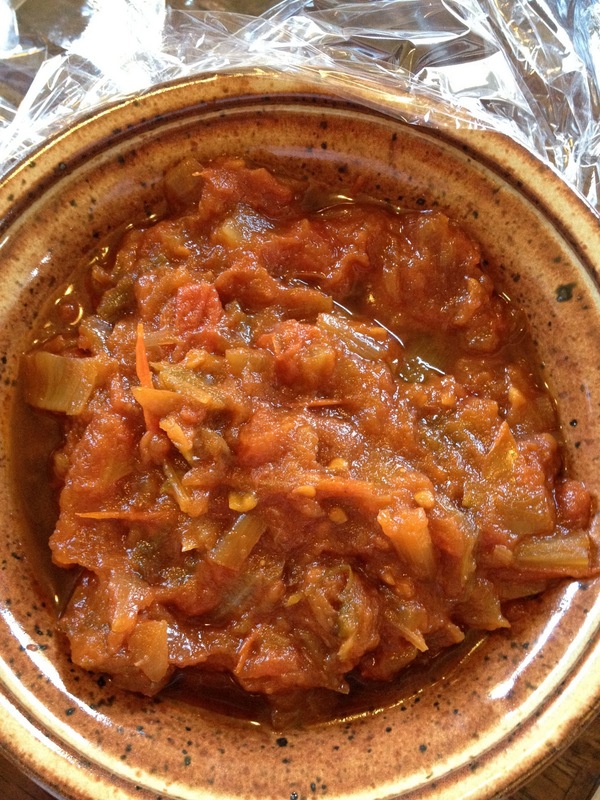 The Tomato marmalade with caramelized leeks and onions came from Foodie Parent. I did use tomatoes that I canned this summer, just drained off some of the liquid. 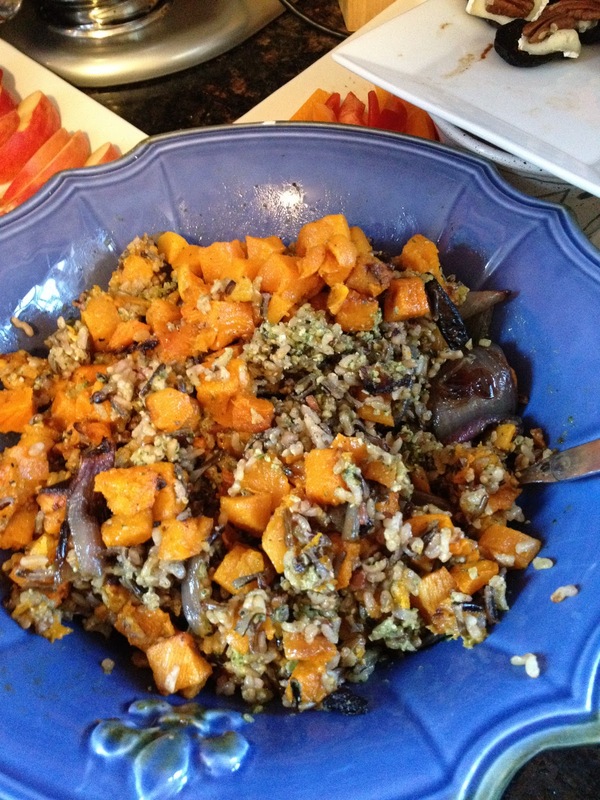 It worked well with the fish, and the ham (for my stepfather) and I sent some home with everyone. As for Pies, I made 2, they were very pretty, and I forgot to take a picture! Oh well. Here is the recipe for the Vegetarian mince meat pie it’s an adapted recipe from Cooks Illustrated. A huge Thank You to Joan, Steve’s mom, for her Pecan Pie recipe, without corn syrup. This will make 2 9″ regular pies, or 1 9″ deep dish with a little left over that you could make into a tartlette maybe. Preheat oven to 350. In a small saucepan, melt butter with brown sugar and add flour, stirring to eliminate lumps and let cool (this shouldn’t come to a boil, just warm enough to melt the butter). Beat eggs with the evaporated milk. Combine milk and egg mixture with brown sugar butter mixture, stirring constantly to prevent the eggs from scrambling. Add pecans, and pour into a pie shell(s). Bake at 350 for 40-45 minutes (55 if making a deep dish). Let the pie cool completely to set. Serve with a little fresh whip cream or vanilla ice cream.